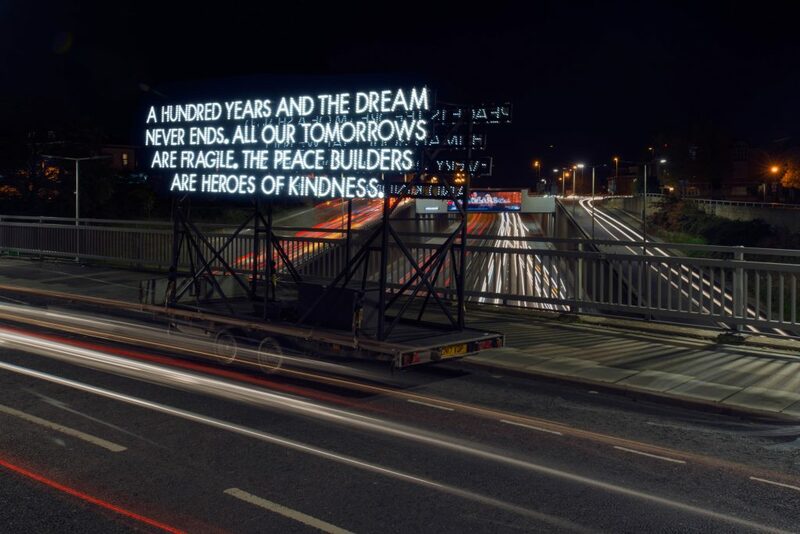 A striking illuminated Peace Poem mounted on a mobile platform will visit Nottingham as part of nationwide tour including London, Dewsbury, Stoke-on-Trent and Peterborough. It was created by internationally acclaimed artist Robert Montgomery. It marks the start of Paper Peace, a year-long project by renowned outdoor arts company Emergency Exit Arts. The Peace Poem tour takes place as we commemorate the 1918 Armistice, 100 years since the peace at the end of World War 1. It will be seen by thousands as it travels along motorways to towns and cities across England. On Saturday 17th November, it will visit Hucknall High Street and Bulwell Town Centre, before heading to Trinity Square and Sneinton Market Plaza in Nottingham City Centre. Local people are invited to share their own messages of peace, which will be displayed on Sneinton Market. City Arts is working with Emergency Exit Arts to bring the Peace Poem to Nottingham. We have programmed an evening of poetry and music for the 17th November, taking place in their geodesic dome, currently up on Sneineton Market Plaza. It will feature readings of poems from the Mercian Regiment Archive and well as performances from local artists including poets Chris McLoughlin, Meddla, singer-songwriter Tori Sheard and singer Cleo Asabre-Holt. Young people aged 18 to 25 are invited to attend the event to find out how they can get involved in the yearlong Paper Peace project. Those who volunteer will receive training from arts practitioners and museum experts to unearth the history of peace activism. The Peace Poem will also be in Sneinton Market Plaza until 7pm on Sunday 18th November. Between 1.30 and 4.00pm, families can join artist Jessica Kemp for a free workshop making puppet doves. From 4.30pm on Saturday the Nottingham Peacebuilders will be taking over the City Arts Dome on Sneinton Market Plaza. There will be live music from David Wilson accompanying projects by digital artist Katja Hock. Kajta’s artwork combines images from Chilwell munitions factory with photos from the battlefields of the Somme. Robert Montgomery, who created the Peace Poem, is a Scottish-born, London-based poet, artist and sculptor regarded as a leading figure in the conceptual art world. He is known for creating art installations from light and text, as well making ‘fire poems’ alight with real flames, He was the British artist selected for the 2012 Kochi Biennale and the 2016 Yinchuan Biennale. In 2012 he installed peace poems at the old Tempelhof Airport in Berlin. Along with the architects Allied Works he was a shortlisted finalist for the UK National Holocaust Memorial in 2017 with the scheme exhibited at the V&A Museum in London. He has a solo show upcoming at the Aspen Art Museum in January 2019.